There’s a lot to recommend a bluestone walkway. The natural colors and textures look great in almost any setting. Maintenance is low. And unlike concrete pavers or brick, bluestone pavers do not require edge constraints. Another pro: Shifting is rarely a problem. If root growth or a frost heave does shift a bluestone paver, repositioning it is relatively easy. Need to fix a broken water main or run an electric line? No problem. Just pry and temporarily lift the pavers out of the way. 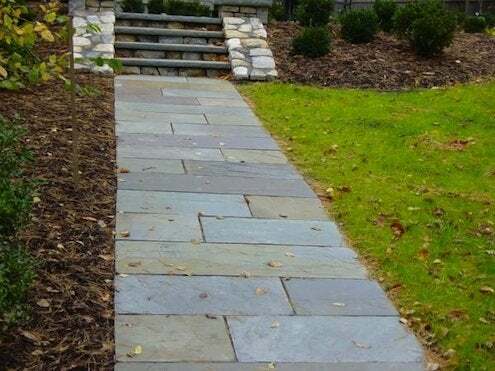 Yet another benefit is that, in contrast to concrete, a bluestone walkway will not prevent water from reaching the roots of prized trees or shrubs. Perhaps best of all is the fact that installing the stones is not difficult. You do need a strong back and a helper, but otherwise it’s a project in which you can expect professional results even if you’ve never before done masonry. Before you begin, gather goggles, earplugs, a dust mask, work gloves and knee pads. You’ll also need a contractor’s wheelbarrow, a level, tape measure, spade, shovel, steel garden rake, a rubber mallet, a masonry wet saw and a hand or power tamper. Stake twine along the edges of your planned walkway. Adjust the twine height along one edge, so it’s at grade level. Then excavate the walkway area to a depth of six inches (always check for location of electric lines and irrigation pipes before proceeding). Run a plate compacter over the excavated path if the soil structure is loose. Fill the path area with stone dust and level with a garden rake. (There’s no need to worry about pitching the walk for drainage, as this will happen at the joints). Next, compact the crushed stone to a height about two inches below grade. Compaction is important to ensure that your stones do not shift. A vibrating plate tamp compactor will speed the job. Because this tool is quite heavy, you’ll need a hand truck or a helper to move it to and from the site. Make at least three passes over the entire base of stone dust or if you prefer, use a manual tamper. Choosing the latter adds hours to most jobs, but you’ll save the hefty tool-rental fee. Note: Plate compactors often come with a reservoir for water that allows the tool operator to release a fine stream during operation. If the unit you rent does not have this feature, soak the stone dust thoroughly after compacting it. This will help remove any remaining air pockets. Allow the bed to drain thoroughly before compacting it once again. Lay the first stone so that its edge aligns with the twine guideline. The first stone is critical; all other stones will be placed in reference to it. If laying stones in a pattern, begin with a full stone. And if you want a full stone at the beginning and end of your walkway, measure to ensure that your plan will allow them to be of equal size. If not, make the necessary cuts in the stones or adjust the spacing in your pattern. Don’t want to bother with the math? Temporarily lay the stones in place to determine if you’ll need to resize the full stones planned for both ends of the path. Making straight cuts is not difficult. Rent a gasoline-powered masonry saw for this purpose. Don’t forget to hook up the saw to a hose; otherwise, you will raise clouds of stone dust and burn up your diamond-grit blade. When all stones are laid, sweep stone dust, sand, or small pebbles into the joints. Keep some of the same material on hand to refilling the joints after a week or two, once they have settled.